Before reading this review, I want to you completely put yourself in a state of silence (unless your on public transit AND WHY ARE YOU READING OVER THIS PERSON’S SHOULDER YOU CREEP). Do you hear that voice? It may not be the loudest voice, but you constantly hear it, “You’re not good enough” or that voice questions each decision you make. Despite all the noise we create in today’s our own minds are what can be our greatest enemies. 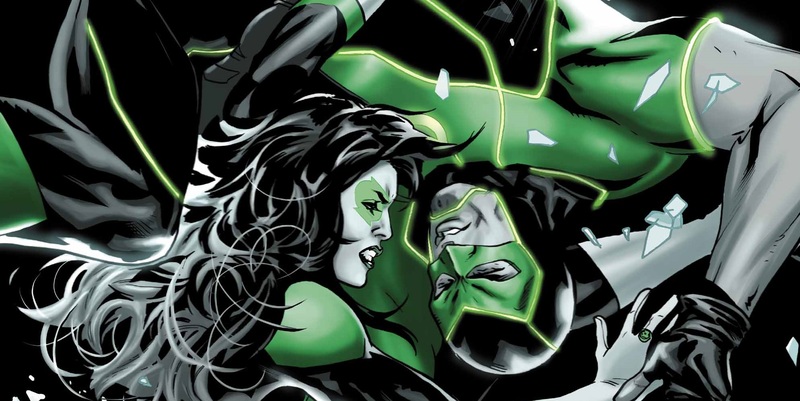 How does this factor into today’s issue of Green Lanterns? Read further on to find out. Warning there will be spoilers going forward. You’ve been warned. I believe I stated in my previous review that I have no experience when it comes to the lore of Dr. Polaris, but the my favorite scenes in this comic are the ones that don’t even technically exist. The battle of one’s mind is a war we as people wage every day, the struggle is indeed real. Sam Humphries continues to press schizophrenia point onto Doctor Polaris and while it’s a bit on the nose it still deliver a compelling dynamic for this character who’s been around since the 1950’s. There’s nothing wrong with a villain being evil and not emotional back story at all (it still works for the Joker and many other DCU villains after all) but even when the trope is considered plaid out in some circles, seeing a villain who faces similar problems that our heroes faces. Proving that that the road of heroes and villains is not really that different. One aspect of this story arc that just isn’t connecting with me is the relationship between Simon and his brother-in-law. Given that I personally didn’t read much of Baz before this new series started so I’m missing so emotional context that is proving vital for Simon. Yes the flashback sequences do help, and I do enjoy the parallels between Doctor Polaris and SImon but it still isn’t enough for me to latch onto his emotional crisis with his brother in law. On the flip side, seeing Jessica actually remain calm cool and collected and save them both was a great moment for her. I’ve settled with the notion that Jessica won’t have these types of sequences all the time, which makes her unique to any other superhero currently. I keep saying it, and I’m gonna say it again but I wish that Eduardo Pansica was the main artist for this series. Great dynamic poses for each character, plus amazing sequential storytelling. I did think that the flashback sequences looked a bit rough but that’s mostly due to the putting a green filter over the panels. I understand that you want to differentiate past and present but putting a ugly green filter as an overlay just make the art look muddy. I would say that all you need is a caption box, but the dialog by Simon should have been enough for readers to understand that the setting has changed. Body language is a crucial element to comic book story telling, and for a character like Doctor Polaris who has two distinct personalities and that is carried through the art. Please DC I will pay 3.99 and only get Green Lanterns once per month if that means Eduardo Pansica becomes the main artist.